Ms. Meng Wanzhou (Sabrina Meng) Deputy Chairwoman, CFO of Huawei Technologies Co., Ltd. Ms. Meng holds a master’s degree from Huazhong University of Science and Technology. Ms. Meng joined Huawei in 1993 and has held the positions of Director of the International Accounting Dept, CFO of Huawei Hong Kong, and President of the Accounting Mgmt Dept. Ms. Meng now serves as CFO of Huawei and Deputy Chairwoman of the Board. TMR Editor’s Note: You can’t do that! You can’t arrest the CFO and daughter of the founder of one of China’s largest telecoms because of the mere suspicion of violating unlawful U.S. sanctions on Iran. Those sanctions by the Trump administration are themselves violations of international law. These patently criminal sanctions by the U.S. were issued, and are only being enforced, on behalf of the APARTHEID state of Israel. The Neocon Zionists in the Trump administration have gone way beyond the edge of propriety with this illegal arrest. They will pay for it in ways that they will never see coming. If ever Trump’s appointed Neocons have kicked a hornet’s nest, it is with this extremely misguided and foolish move against China. Really, how stupid are these Israel Firsters at the DOJ. Stupid enough to start a regional war with China, Russia, Iran, Turkey, etc. Truly, there’s no greater danger to the American Republic than the numerous dual Israeli citizens in the U.S. Government. They are the bane of the United States of America and must be removed from their public offices post-haste. N.B. The article posted below provides more details to the arrest of Ms. Meng Wanzhou (Sabrina Meng) Deputy Chairwoman and CFO of Huawei Technologies Co., Ltd. Mere hours after Chinese officials finally affirmed President Trump’s description of Saturday’s trade ‘truce’ – this after fears that the true nature of the agreement might have been “lost in translation” helped trigger the worst one-day market selloff since October – the DOJ has gone ahead and kicked the hornet’s nest, seriously jeopardizing the prospects for a prolonged trade detente between the world’s two biggest economies. 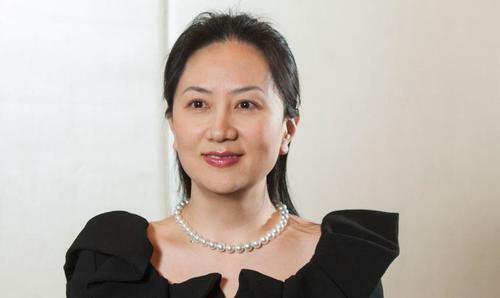 Canada’s Globe and Mail reported late on Wednesday that on December 1, Canadian authorities arrested Wanzhou Meng, the CFO of Huawei Technologies and daughter of the telecom giant’s founder, Ren Zhengfei. An ex-officer with the People’s Liberation Army, Ren is one of the country’s most revered business figures. Meng is said to be a “rising star” at Shenzhen-based Huawei, the world’s second-largest maker of telecommunications equipment. Reuters reported in 2013 that Ms. Meng served on the board of a Hong Kong-based Skycom Tech that later attempted to sell embargoed Hewitt Packard computer equipment to Iran’s largest mobile-phone operator. “Wanzhou Meng was arrested in Vancouver on December 1. She is sought for extradition by the United States, and a bail hearing has been set for Friday,” Justice department Ian McLeod said in a statement to The Globe and Mail. “As there is a publication ban in effect, we cannot provide any further detail at this time. The ban was sought by Ms. Meng. Wanzhou is facing extradition to the US on suspicions that she violated US sanctions against Iran (allegations that nearly resulted in a devastating Treasury “death sentence” earlier this year for Huawei rival ZTE). At least 13 pages of the Skycom proposal were marked “Huawei confidential” and carried Huawei’s logo. Huawei has said neither it nor Skycom ultimately provided the HP equipment. HP said it prohibits the sale of its products to Iran. Prosecutors in New York have been investigating suspicions that Huawei violated US sanctions against Iran since earlier this year. News of the probe was first reported in April. The G&M adds that the probe is being run out of the U.S. attorney’s office in Brooklyn. We seriously doubt the Chinese leaders will interpret Wanzhou’s arrest as a gesture of good faith and trust at a time when negotiations over a possible trade truce were expected to finally begin in earnest after a months-long standoff. To understand the magnitude of this arrest, just imagine how the US would react if Beijing arrested Jeff Bezos’ (hypothetical) daughter? As investors digest the implications of the DOJ’s investigation, expect a kneejerk response where investors shoot first Thursday and dump shares of big Huawei suppliers, as they did with ZTE. Should they do the same with broader S&P futures amid concerns that the trade truce is back to square one zero, Trump will have a choice: releasing Meng or watching the any last hopes of Christmas rally fade into the distance.